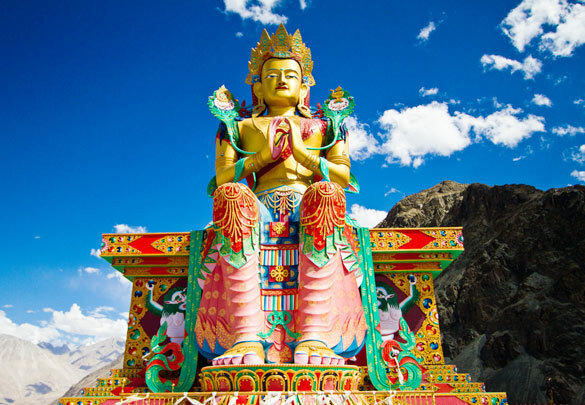 Hemis festival is one of the most famous monastic festivals in June to commemorate birth of Guru Padmasambhava, the founder of Tantric Buddhism in Tibet. 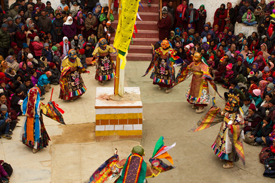 The sacred dance drama of the life and mission is performed wearing facial masks and colorful brocades robes. The three day festival takes place from 9th to 11th. Especially the monkey year festival, which comes in a cycle of 12 years. During it the four-storey thanka of Guru Padma Sambhava is hung in the courtyard and other precious thankas are also exhibited. 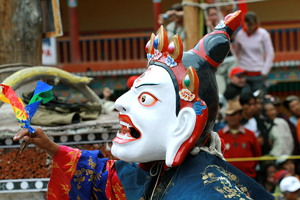 The monks of Stok and Spituk monasteries also celebrate Stok Gruru Tsechu for two days with mask dances performed. It is also held in Feb. around a week before the Matho Nagrang. Durin g the festival two oracle appears, but they are laymen from the same village prepared by monks to receive the spirit of the deities. The Losar (New Year) celebration is followed by Galdan Namchot, the birth anniversary of pa who introduced Gelukpa School of order. During Namchot people illuminate their houses, monasteries and mountains and make offerings in the houses and monasteries. The Losar festival is celebrated in the eleventh month of Tibetan calendar, two months ahead of Tibetan New Year. In early 17th century, King Jamyang Namgyal decided to lead an expedition against the Baltistan forces in winter; therefore he decided to celebrate the festival two months before. Later it became a tradition and being celebrated in the eleventh month.